← Jailbreak iPhone 4S and iPad 2 Released! 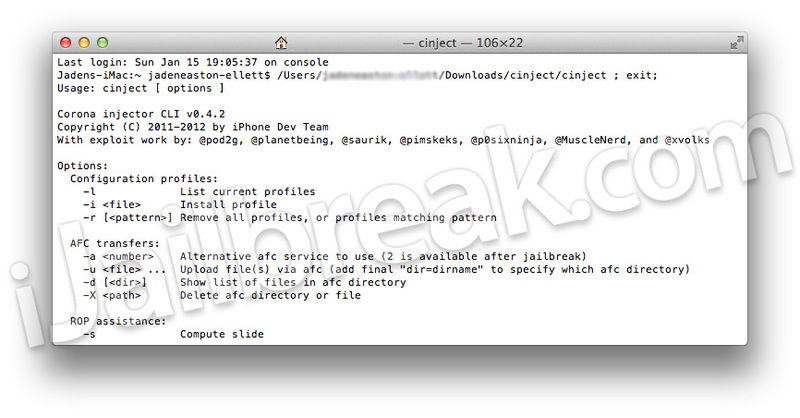 The iPhone Dev-Team have released the command line interface (CLI) version of the iPhone 4S and iPad 2 Untethered Jailbreak to the public. This new CLI Jailbreak Tool will allow users to go through the Jailbreaking process from start to end by typing in commands through terminal. The reason someone would want to go to the trouble of using CLI over the GUI (graphical user interface) counterpart Absinthe. Is because the CLI tool will allow you to debug your Jailbreak to help find out why you are having errors Jailbreaking your A5 iOS device. If you are interested in downloading the CLI tool to debug your A5 iOS device Jailbreak or simply want to take advantage of some of the advanced options CLI offers. You can download the CLI tool directly by clicking here (not working? Click here instead). Additionally, the ReadMe for the CLI tool can be found by clicking here. This entry was posted in iPad, iPhone and tagged A5, absinthe, cli, jailbreak, mac, untether. Bookmark the permalink. would be ok. I’m absolutely enjoying your blog annd look forward to new posts.